Are you planning a trip to Fuerteventura in Canary Islands, and thinking of pampering yourself? The perfect destination would be the Grand Hotel Atlantis Bahia Real — choosing this five-star property would mean receiving ultimate R&R for you and your travel companions. The Grand Hotel Atlantis Bahia Real is located right on the beachfront and offers the most seamless view of Lobos and Lanzarote islands – it's an oasis surrounded by lashing greens in the back and a beach paradise on the front. Greatly influenced by Moorish and colonial history, the architecture of the hotel is one-of-a-kind. The hotel’s 242 rooms come in a variety of options to suit all guests, each with plush amenities and oozing comfort. The Bahia Vital Spa is a perfect pastime for those who like to be pampered, with health, wellness and fitness facilities available, while, similarly, the chill out zone (complete with Balinese beds) and bar overlooking the ocean offer a peaceful atmosphere. Explore activities in the surrounding resort such as deep-sea fishing, surfing and kite surfing - boat trips are also a great way to explore the island while floating across the waters. 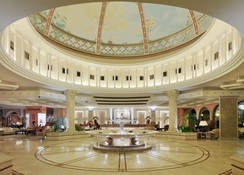 The Gran Hotel Atlantis Bahía Real is ideally situated in Corralejo, Las Palmas, Spain. Calle Minerva shopping center is a great place to mooch during the daytime, and is within just 1km from the resort. Beach lovers will be in their element, as the sandy Corralejo Beach is only 2.9km away from the hotel. The Fuerteventura Airport is about 37.4km away from the hotel, too. Built in 2003, the hotel houses 242 rooms and suites (170 rooms and 72 suites), spread across three floors. Each room speaks of elegance, comfort and luxury. The view from the rooms is spectacular, making the hotel a popular choice for honeymooners, families and couples seeking for a premium trip. 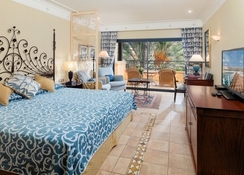 The rooms and suites are organised into categories which include Double Deluxe, Deluxe Junior Suites, Family Room, Bahia Suite, Double Deluxe Sea View, Deluxe Sea View Junior Suites, Atlantic Suite and Royal Suite. The rooms are highly maintained and designed with features such as a safe deposit, mini bar, TV with satellite, air conditioning & heating, radio & CD player, phone in bathroom, free internet, telephone and hairdryer. Gran Hotel Atlantis Bahia Real houses nine restaurants and bars and employs an army of remarkable chefs. Each restaurant is unique with a different set of ambiance and cuisine. La Cúpula de Carles Gaig redefines the definition of gastronomic experience; it serves progressive cuisine under Chef Carles Gaig. Yamatori is an authentic Japanese restaurant specialized in teppanyaki — it also has a sushi bar. Las Columnas is an elegant restaurant that serves authentic traditional Spain cuisine — the assortment will even please an epicurean. Finally, La Alacena Real serves international cuisine and covers a huge selection — in case you wish to eat some you’re familiar with. The hotel has a wide range of services to keep you occupied and spoil you. Other than these, you will have many more options for food and drink, including Coco Bahia Lounge & Club, Beach Club Las Palmeras, Coco Bahia Bar, Piano Bar El Mirador and Bar-Salon La Boheme. There are numerous watersports activities and land-based activities around the hotel to keep the guests engaged. If you’re in a mood to shop, you can head to Corralejo where you can shop for jewellery, perfumes and other goods. Or why not treat yourself with a journey of wellbeing and relaxation amid the invigorating pleasure of the Bahia Vital Spa? Superb hotel,the staff could not have been more helpful and went the extra mile at all times.The food and service could not be faulted in any way.Would definitely stay again.